CS-Cart is simple and robust solution that powers thousands of online stores around the world. It is an open source shopping cart that doesn’t limit the number of entities, so this platform is suitable for businesses of any size. In addition, there are lots of extensions that can expand the functionality of the shopping cart. But which of them worth your attention? 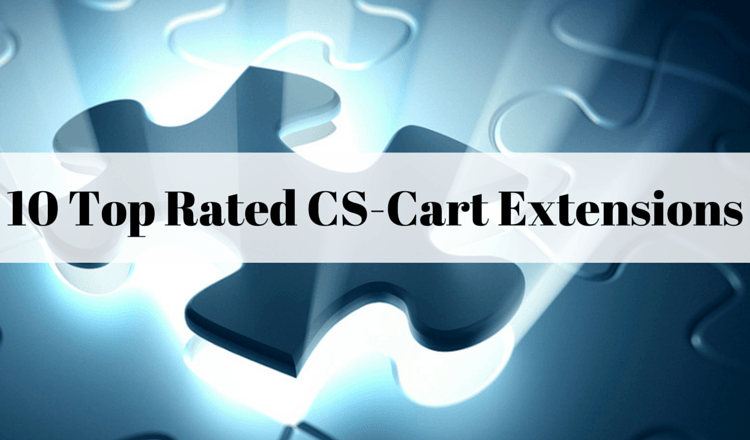 Let’s take a look at top 10 extensions that every CS-Cart store must have. Blogging is one of the key terms while talking care about SEO and lead generation. If you post interesting content regularly, customers will come back to your store more often. By default, CS-Cart do not allow merchants to add blog page, but this extension can change things for the better. Announce new products, post reviews and weekly updates or tell about current discounts and check how traffic and sales increase. Once new customer looks through your store for the first time, there might appear a lot of questions. Some of them are pretty common, about shopping, payments and returns. To reply them all, you will need to hire an army of support managers. So, add a FAQ section to the store and place the answers for common questions there to save your time and money. How many products does your store contain? Is it easy for customers to find what they are looking for, if there are no compass for your store? Don’t let them drifting around with no result. Add Mega Menu to your CS-Cart store and let users search for products faster and with minimum efforts. Onsite search is a powerful tool that can drive sales and make customers happy. Clients, who browse products on store this way are more likely to make a purchase. But most of e-merchants don’t pay much attention to it and usually ignore this powerful tool. So, your goal is to provide users with the most that you can. An extension by Searchanise, offers a powerful addition to your store functionality. While customers start typing a keyword, they will see suggested items immediately. This addon is awesome, efficient and free that makes it a must have item for every CS-Cart store. If you wish to drive the sales of several products, creating a deal of the day can be a one of the keys to success. This extension will help you to set up a perfect presentation of an item with timer and CTA button. Show this message on any page of the store and burst your sales beautifully. Todays e-Commerce has become mobile and it is not a secret for the leaders of the market. But is your online retailer ready for a new age? Twigmo provides CS-Cart store owners with a unique mobile office that looks and works perfectly for any pocket devices. It can be easily integrated with your shopping cart after fast installation. CS-Cart is a powerful solution that doesn’t require high level of technical skills for daily store management. Due to this fact, Cart2Cart provides store owners with an opportunity to migrate all data to this shopping cart easy and without efforts. Simply connect your stores, select entities and move all data in a click. In addition, there is an opportunity to transfer several entities to CS-Cart for free to check the store on a new shopping cart. The best way to describe physical product is to place high resolution images on the items page. But, when you allow to spin appearance and check the product from all angles, customers will be more satisfied with your listings. Magic 360 extension provides you with a chance to improve expand the opportunities of items catalog on your store beautifully. When store visitors look through the products that are listed on site, they also search for interesting reviews from happy buyers. With Yotpo extension, customers will be able to place feedbacks in the most convenient way. Send follow up emails after purchase and place a customizable widget right on the products page to present customer reviews for the audience. The most of your customers wish to keep an eye on their order after paying money. It makes them come back to your online retailer from time to time to check the changes. In addition, this option provides positive experience so users are more likely to buy from you again. Moreover, an opportunity to check the status of the orders makes your retailer more trusted for new clients. That is why After Shop Tracking Addon appears to be a useful tool to turn users into returning customers. So, that are the most efficient extensions that you can easily add to your CS-Cart store to improve its functionality. Choose addons that will help your business best and enjoy the results. But if your current store doesn’t provide you with the opportunities described above, you can easily migrate to CS-Cart without technical skills needed.